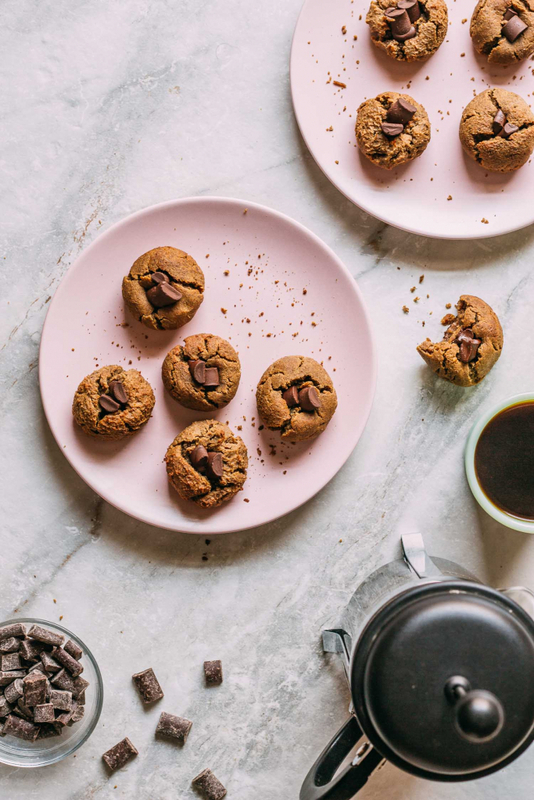 Get ready to devour your very first batch of homemade Peanut Butter & Chocolate Cookies. That’s what we did! 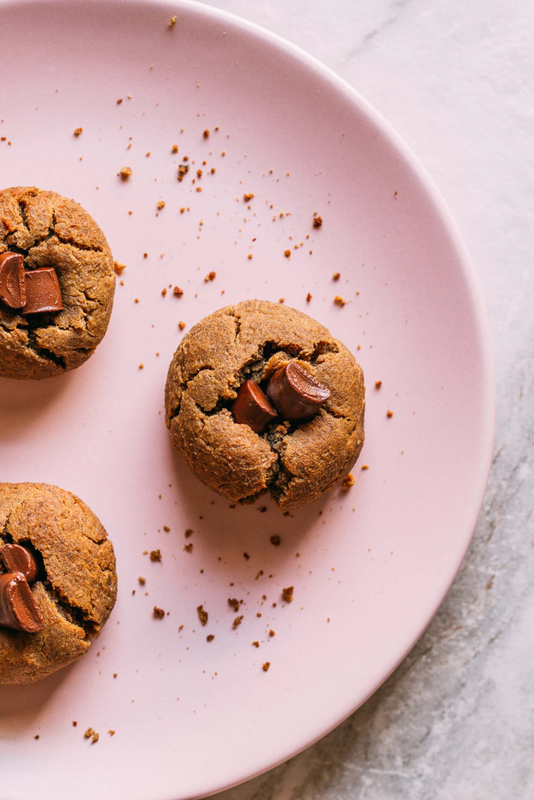 The fact that these are one hundred percent gluten-free, plant-based cookies won’t even cross your mind when you taste them. But inside you’ll know that you hold the secret to the healthiest peanut butter and chocolate cookie on the planet! You may notice that these soft and tender, cookies are very similar to our 20-Minute Peanut Butter Chickpea Cookies. And just like those, these oil-free and refined sugar-free Peanut Butter & Chocolate Cookies require only1-bowl. Plus, they need absolutely no flour, making them naturally gluten-free! And if peanut allergies are an issue, that’s not a problem, either! This recipe bakes up nicely when you sub in your favorite seed butter for the peanut butter. Even though there are no eggs or dairy in this delicious vegan recipe, you’ll swear otherwise. These cookies taste like that old sugar and butter recipe with a Hershey’s kiss in the center. We remember those peanut butter blossom cookies. And yes, cute name; but they’re nowhere near as healthy as these! Besides, ours take the cute cake with how they look a bit like tiny pumpkins! And speaking of healthy, these babies have some unusual ingredients worth mentioning. First, there’s the inclusion of chickpeas which is a huge win in for about a million reasons. As you probably know, chickpeas are a terrific source of plant-based protein and fiber. Secondly, the chickpeas add creaminess without adding any additional fat. And lastly, the little bit of aquafaba left on the chickpeas adds an ideal bit of added moisture. 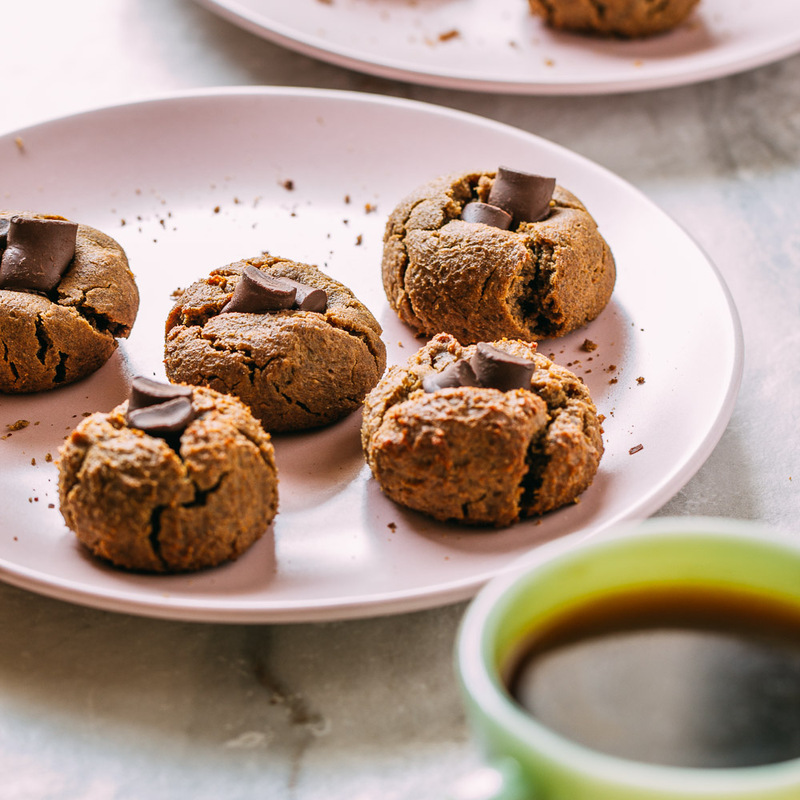 And to bring the sweetness, we turn to mineral-rich Medjool dates for these wholesome Peanut Butter & Chocolate Cookies. Again, by sweetening with Medjool dates, we make the decision to add nutrients as well as sweetness. Along with other vitamins and minerals, Medjool dates provide considerable portions of folate, calcium, magnesium, phosphorus, and potassium. And How Do These FABULOUS Peanut Butter & Chocolate Cookies Taste? 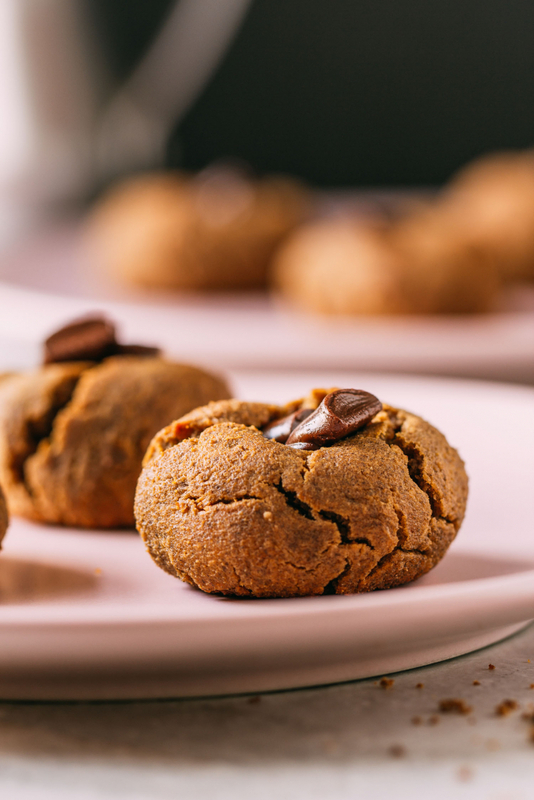 Well, just like our classic, gluten-free and vegan criss-cross peanut butter cookies, these peanut butter chocolate cookies are pure heaven! We almost named this recipe heavenly cookies. However, we ultimately decided it’s best to mention the peanut butter and chocolate in the title. Beyond that other divine world-y description, these cookies taste buttery, soft, lightly sweet, delicate, comforting, homey, and surprisingly satisfying. Did we say buttery yet? And remember, our Peanut Butter & Chocolate Cookies are buttery without a drop of animal byproducts. The delicious buttery flavor is from the peanut butter – nothing else! You’ll receive boatloads of compliments when you share a batch of these with friends, family, and co-workers. So get ready for the influx of applause for being a talented baker! But before you share them, we suggest that you sit and savor a cookie or two yourself. It’s so important to remind yourself to take time to enjoy things like this healthier treat. We’re preaching to ourselves too, by the way, so don’t be offended. So enjoy one, or three, (they’re little, and we won’t tell) with a cup of your favorite tea or coffee. And since nearly everyone likes the taste of peanut butter, chocolate, and bananas, try our 5-Minute Creamy Cardamom Banana Milk. When you share your thoughts about a recipe you’ve enjoyed, you’re helping other people who are considering trying it too! And pinning our recipes on Pinterest helps spread the veggie joy behind what we’re creating here – so thank you! And sharing our recipes on Facebook is another terrific way to help share the news. After all, we all agree and want the world to see that plant-based vegan food tastes GOOD! 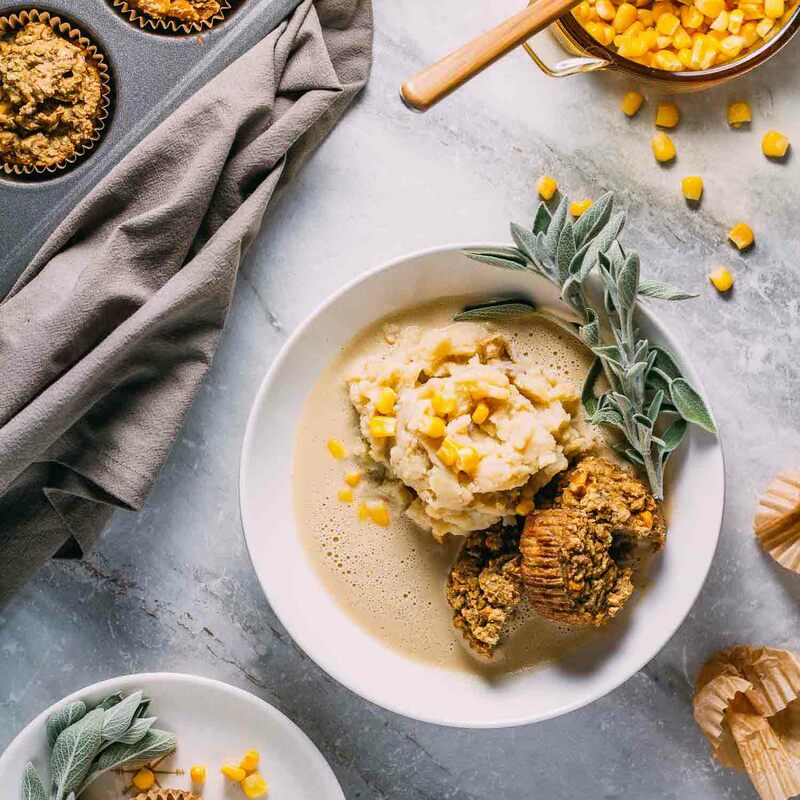 We love a recipe where you get to mix everything in one bowl or even better, combine everything in the food processor. And that’s just one of the things that make these Peanut Butter & Chocolate Cookies so easy to make! You put all of the whole food plant-based, gluten-free ingredients into one-bowl or food processor container and mix. And bam, just like that, you create around 16 delicious cookies from one quick batch. These cuties are a crowd-pleasing cookie, and they’re a breeze to make. They’d even fit in nicely during FALL as they sort of look like little pumpkins! And here’s something nice, they taste as at home paired with a cold glass of creamy homemade 5-Minute Creamy Banana Cardamom Milk, as they do with hot coffee or tea. On those days when you prefer to skip the chocolate part of this cookie, we’ve got you covered. 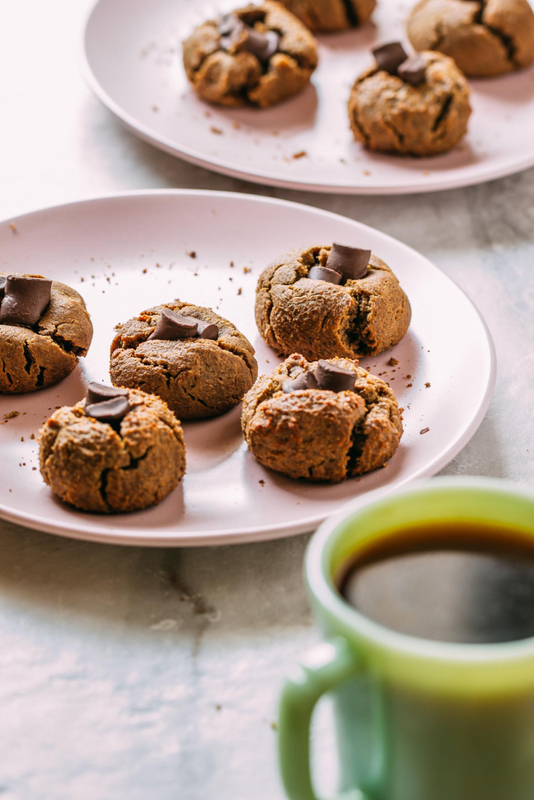 For a chocolate-free version of this cookie make our recipe for classic criss-cross Peanut Butter Chickpea Cookies! about six pitted Medjool dates - We enjoy using these moist dates more than any other brand because they're always soft and juicy! Begin by preheating the oven to 350º F and lining a baking sheet with parchment paper or a nonstick silicone baking mat. Next, add in all of the remaining ingredients and mix until combined. The batter will be on the sticky side but don't worry, that's what you want. Do not be tempted to add flour to fix the wet and stickiness; ride this one out. Scoop the cookie dough by rounded tablespoon-size balls and gently roll with damp hands into a ball shape. Place the balls of dough onto your prepared baking sheets. In the center of each cookie dough ball, gingerly press a couple of the chocolate chunks. If you prefer your peanut butter cookies without the chocolate center, check out this recipe to successfully create a traditional criss-cross patterned cookie. Bake for about 12-14 minutes. After removing from the oven, allow these beautiful cookies to cool for 10 minutes on the pan. Once your homemade cookies have cooled completely, store them in a covered container at room temperature for up to a day or so. If intending to save beyond a day or two, we recommend that you keep these cookies in the refrigerator or freezer until you're ready to enjoy! When substituting listed recipe ingredients with what you have on hand in the pantry, be prepared to expect a few visual and taste differences. Also, be aware of things such as wet and dry ingredient balance. The ratio of wet to dry will need to mimic the original recipe closely for the method to work using the particular combination of substitutions you've opted to use. 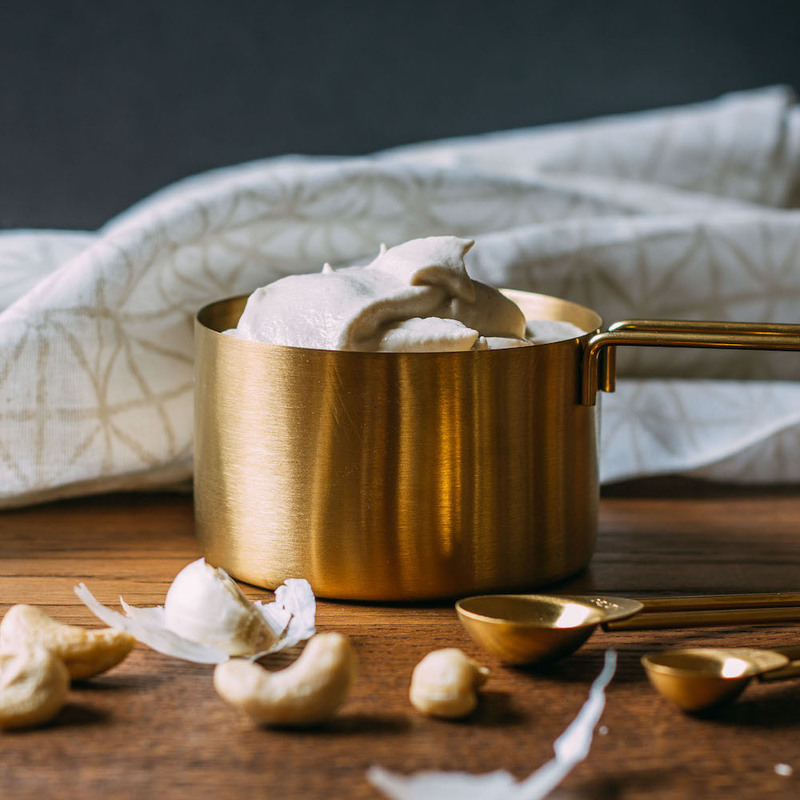 Even elements as relatively as simple as using a different variety of peanut butter than listed in the ingredients can produce notable variants in the outcome of a recipe. 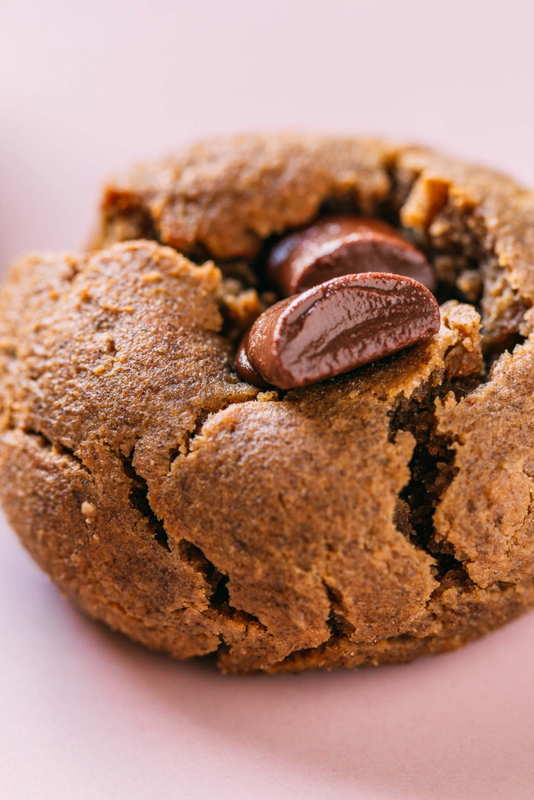 We have made this recipe using up to 1/4 to 1/2 cup of the pure maple syrup in the place of the dates and have had total success even though the cookie is flatter rather than ball-shaped. When using maple syrup, the cookie dough is softer, wetter, and the shape of the baked cookie is understandable flatter.